​Need to clean your curtains? Whether you're doing a spot of spring cleaning or preparing to hand over your rented apartment, let us handle the chore of curtain dry cleaning in Singapore! With a dedicated facility and our experienced team of curtain dry cleaning professionals locally, we'll ensure your curtains are cleaned thoroughly with the appropriate dry cleaning method. Contact us today for a non-obligatory quote! On arrival, we will assess your curtains, highlight issues and recommend the appropriate treatment method. Your trusted curtain cleaning service provider Singapore. We will remove your curtains (if you need our installation service), pack, weigh them on the spot and calculate the bill. Full payment by NETS or Bank transfer is requested on the day of pick up. Book a date for delivery/installation with us. We will update on the progress of your cleaning of curtains and send a reminder prior to this date. Curtains provide privacy, block out sunlight and beautify homes. But do you know that they also act as filters to dust and airborne particles that enter your homes through open windows? Dust mites, pet hair, mould spores and all kinds of allergens get trapped in curtains and affect indoor air quality.​ If you have family members with respiratory conditions, prolonged exposure to contaminants in the air can trigger allergies or worsen pre-existing conditions. Even individuals who don’t have allergies may sneeze when they come into contact with dust. Studies have also shown that young children are more likely to develop asthma when they live in environments with higher levels of mould in the air. While it is impossible to get rid of every mould spore or dust mite, taking steps to reduce their number can help to protect your family's health. 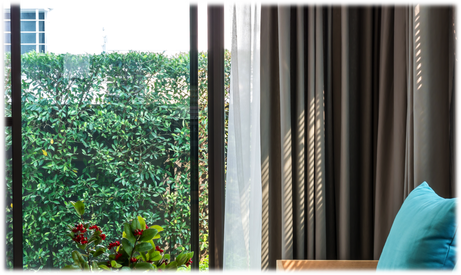 Giving your curtains a thorough cleaning every 6-8 months not only helps to create more hygienic surroundings, but also makes them last longer. If you stay in dust-prone areas or if someone in your family smokes, you may want to clean them even more regularly. Because curtains need less attention than cleaning the floors or washing the bathrooms, it is easy to forget about them completely. When you finally realise that they need to be cleaned, the task of taking them down and hanging them back can be such a hassle – just putting back the curtain hooks can take hours! While some curtains can be put into your washing machines, those that are lined, made of silk, linen or delicate fabrics have to be professionally dry cleaned. This is because the combination of water, heat and friction in our home washing machines may cause the fabric to shrink, fade or be damaged. We can help to get your curtains dry cleaned professionally in Singapore. We can also help to take them down and install them after dry cleaning. If you are leaving the country or handing over your apartment, we can even help to coordinate with your agent or the owner for the delivery of the curtains. Contact us to find out more.